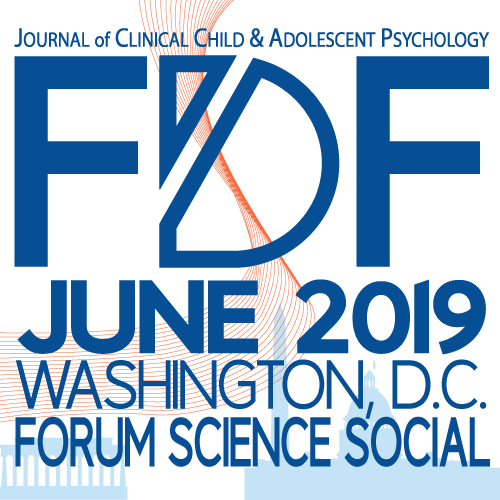 The 2019 Forum will be in Washington, DC, on June 28 – 29, 2019! We will hold the Forum on the top floor of the American Psychological Association’s home office (http://spireeventsdc.com). We will accept abstract submissions until 11:59 pm (EST) on March 22, 2019. At the Forum, we render our poster presentations in an all-digital format. Poster sessions occur during our Poster Session Social: A catered social event held on the first afternoon of the Forum. If your abstract is accepted for presentation we will prompt you via email to upload your presentation into our digital system, saving you both time and money! Our presentations are also the backbone of our early career award program. Each year, the Editor of JCCAP, Dr. Andres De Los Reyes, convenes a committee of internationally recognized scientists. This committee selects several promising early career scientists who are presenting their research at the Forum to receive the Future Directions Launch Award. The award recognizes early career scientists conducting research in the areas highlighted during the Forum that year. For 2019, the Future Directions Launch Award will recognize early career scientists who submit abstracts with content that fits within the areas of (1) Mediators of Treatment, (2) Immunology, (3) Adversity, and (4) Parent-Child Separation. On the first day of the Forum, awardees give TED Talk-style presentations about their work. The Future Directions Launch Award serves as a capstone to the academic training of its recipients—a signal to the field and larger public that they are ready to enter academia and begin independent research careers. Anyone presenting at the Forum must register and pay the Forum’s registration fee. Registration is currently open. Abstracts must describe a complete representation of your work and cannot be a “work in progress” that has yet to yield discernible findings. We only accept abstracts that report findings from empirical work (e.g., experiments, controlled trials, archival database studies, psychometric studies, controlled observations, field studies, quantitative reviews). At each Forum, four leaders in mental health research give addresses on innovative areas of research. Thus, we will be especially interested in abstracts that report research in these areas (i.e., for 2019: parent-child separation; adversity; immunology; treatment). However, we welcome abstracts on all research relevant to mental health, including work across the lifespan (e.g., young children, adolescents, adults)!